I’m a lumberjack and I’m OK!! Tiiiiimmmmmmbeeerrrrrrrrrrrrrrr! That’s right, the lumberjacks are coming to Morzine and they’re serious about their skills. 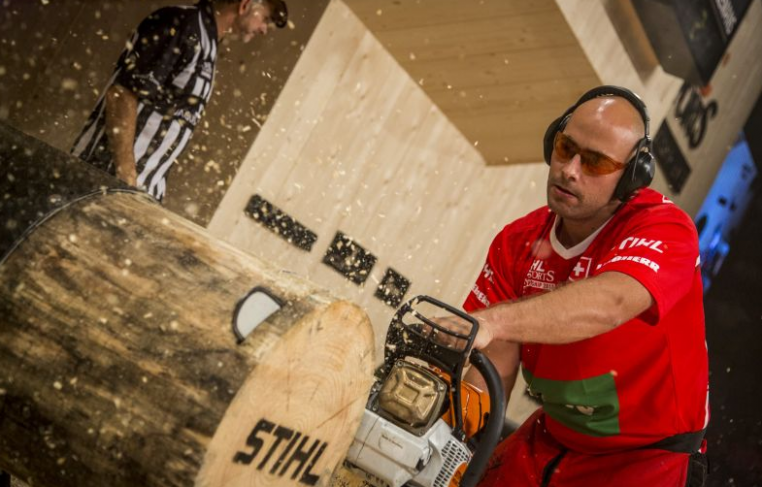 On July 13th and 14th, Morzine will play host to the French Lumberjack’s Championship and we’re here to give you the lowdown. – Springboard chop (A Spectacular Challenge): In this discipline competitors must stand on two springboards wedged into a vertically fixed trunk. The aim is to chop out a wooden block measuring 27 cm at the very top of the trunk. – Standing Block Chop (An Exercise in Precision): This challenge simulates felling a tree with an axe. A 30cm thick trunk is placed vertically and must be severed laterally as quickly as possible. – Underhand Chop (A speed exercise): The challenge consists of splitting a felled tree. Participants have to stand on a 32cm thick trunk fixed horizontally and split it as quickly as possible with an axe. – Single Buck (Manual Saw): Challengers have to saw through a trunk measuring 46 cm across. The trunk is laid flat and cut with a 2 metre saw. – Stihl Stock Saw (Chainsaw): After starting the chainsaw and laying it on the ground, challengers must pick it up and use it to cut a 40cm thick trunk as quickly as possibly once it starts. – Hot Saw (Competition Chainsawing): Using customised chainsaws, the aim is to cut three complete “cookies” within a 15cm area out of a horizontal trunk measuring 46cm thick as quickly as possible. Wow, it all sounds pretty intense. Have you ever been to a Lumberjack Championship? No, I thought not. See what the good people of Morzine offer you – unique and original experiences at your fingertips! Come visit us to ensure you don’t miss all the fun which will take place outside the Tourism Office this July! Next: Hotel L’aubergade is the place to relax after Pass’Portes du Soleil!